Registration to participate in the Convocation Ceremony begins March 26 and runs through April 19. The ceremony will be 1:00–3:00 p.m. on Saturday, May 11, 2019 in Foellinger Great Hall at Krannert Center for the Performing Arts. Please note that due to the overwhelming number of late registration requests we received in past years, we will not be allowing any late registrations for the 2019 Convocation. Tickets are required for everyone, including babies being held and toddlers, to attend this ceremony. Our venue accommodates a limited number of guests and we must work within the limitations imposed by the building fire code and number of graduating participants. Each graduate is guaranteed up to two guest tickets when registering to participate in this ceremony. Graduates: After you have registered to attend our ceremony, you will be able to pick up your tickets in 313 Altgeld Hall beginning May 1 until May 8. All graduating seniors must complete the Senior Questionnaire prior to picking up their tickets. To request additional tickets, please complete your registration and then email your name and the number of extra tickets requested to Staci Walker (sdw@illinois.edu) in 313 Altgeld Hall. Once the number of extra tickets has been determined, they will be distributed between those on the wait list. Graduates on the wait list will be notified by April 29 about their requests for extra tickets. **Note: It is possible that NO EXTRA TICKETS will be available! Graduates should report to Level 2 of Krannert Center by 12:00 p.m. to check-in and line up. The check-in desk closes at 12:30 p.m. PLEASE NOTE: Any students arriving after this time will not be permitted to participate in the ceremony. What should I bring to the ceremony? Graduates should arrive wearing their regalia (including the white tassel, and not the souvenir orange and blue tassel) and will receive their reader card upon check-in. How do I get to Krannert Center/Where can I park? A professional photographer will take pictures of you as you receive your diploma cover from the chair of the department. You will be able to order these photographs and will receive information about ordering when you pick up your tickets. For attendees who have accessibility inquiries, contact Nick Puddicombe, Patron Services Director at Krannert Center for the Performing Arts, via email (puddicom@illinois.edu) or phone (217-244-0572) at least one week prior to the ceremony. Please be prepared to provide the following information for attending the Mathematics and Statistics Convocation Ceremony, Saturday, May 11, at 1:00 p.m. in Foellinger Great Hall: specific accessibility need(s), how many people there are in the party, and an email or phone number for the contact person in the party. When you arrive, you will need to indicate that you have a reservation under this name. An advanced reservation is the ONLY way your entire party will be able to be seated together in our accessible seating areas. Any unclaimed reservations will be forfeited five minutes before the ceremony begins. Accessible-only parking spaces are available on all levels of Krannert Center’s underground garages and are located close to the elevator lobbies. Four spaces (one in each garage) accommodate vans (and one in Yellow Parking is designated as a van-only space). Ushers will be available to assist you around the building as well as from the parking lot to your theatre seat and back again. Buttons for usher service are located in each elevator lobby. 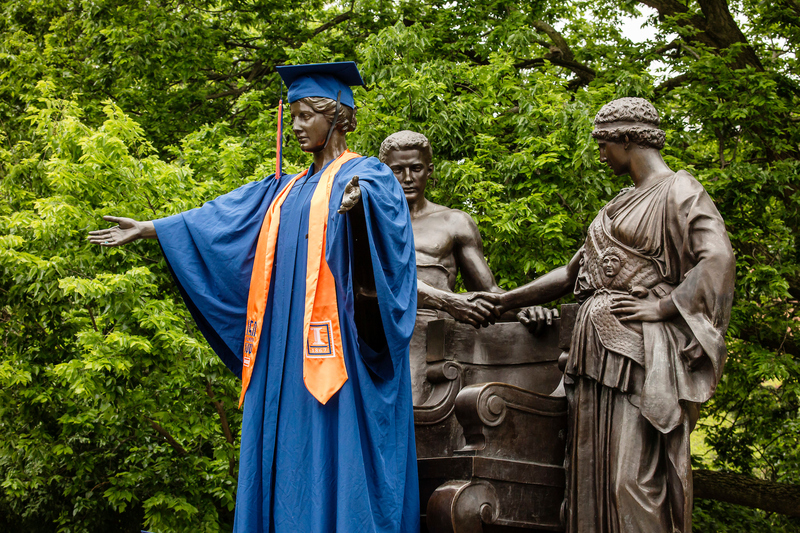 All graduates and degree candidates participating in the Mathematics and Statistics Convocation ceremony are required to wear University of Illinois at Urbana-Champaign custom regalia designed specifically for the University of Illinois at Urbana-Champaign campus. Information for ordering and returning your regalia, including distribution times and places can be found here. The ceremony will be 1:30 – 3:00 p.m. on Saturday, May 13, 2017 in Foellinger Great Hall at Krannert Center for the Performing Arts. The deadline to register to participate is April 21. Note: we do not allow any late registration. Tickets are required for everyone, including babies being held and toddlers, to attend this ceremony. Our venue accommodates a limited number of guests and we must work within the limitations imposed by the building fire code and number of graduating participants. Each graduate may request up to four guest tickets when registering to participate in this ceremony. Graduating Seniors: You will pick up your tickets in 313 Altgeld Hall from May 1 - 10, 2017. You must complete the Senior Questionnaire prior to picking up your tickets. To request additional tickets, please complete your registration and then email your name and the number of extra tickets requested to Liz Vonk (eirelan2@illinois.edu) in 313 Altgeld Hall. Once the number of extra tickets has been determined, they will be distributed between those on the wait list on a first come, first served basis. Graduates on the wait list will be notified between April 24 and May 1 about their requests for extra tickets. It is possible that NO EXTRA TICKETS will be available! When/Where should I arrive? Graduates should report to Level 2 of Krannert Center by 12:30 pm to check in and line up. The check-in desk closes at 1:00 pm. PLEASE NOTE: Any students arriving after this time will not be permitted to participate in the ceremony. All other personal items (backpacks, cameras, purses, etc.) should be left in your vehicle or with relatives or friends. We do not have a secure location for you to leave these items during the ceremony. How do I get to Krannert Center and where can I park? Directions to Krannert Center and information on parking are available here. All PhD graduates will need to contact their advisors prior to registration to make sure the advisor is available to hood them at the ceremony. For Mathematics graduates, if your advisor is unavailable, then Rick Laugesen, Director of Graduate Studies, will be available to hood you at the ceremony. For Statistics graduates, please contact Aaron Thompson (aaron5@illinois.edu) in 101 Illini Hall. For attendees who have accessibility inquiries, contact Nick Puddicombe, Patron Services Director at Krannert Center for the Performing Arts, via email (puddicom@illinois.edu) or phone (217-244-0572) at least one week prior to the Convocation. Please be prepared to provide the following information for attending the Mathematics and Statistics Convocation ceremony, Saturday, May 13, at 1:30 p.m. in Foellinger Great Hall: specific accessibility need(s), how many people there are in the party, and a contact person in the party. When you arrive, you will need to indicate that you have a reservation under this name. An advanced reservation is the ONLY way your entire party will able to be seated together in our accessible seating areas. Any unclaimed reservations will be forfeited two (2) minutes before the ceremony begins.